Rembrandt Harmenszoon van Rijn (Dutch: ( ); 15 July 1606 – 4 October 1669) was a Dutch painter and etcher. He is generally considered one of the greatest painters and printmakers in European art and the most important in Dutch history. His contributions to art came in a period of great wealth and cultural achievement that historians call the Dutch Golden Age when Dutch Golden Age painting, although in many ways antithetical to the Baroque style that dominated Europe, was extremely prolific and innovative, and gave rise to important new genres in painting. 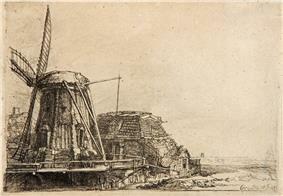 Rembrandt Harmenszoon van Rijn was born on 15 July 1606 in Leiden, in the Dutch Republic, now the Netherlands. He was the ninth child born to Harmen Gerritszoon van Rijn and Neeltgen Willemsdochter van Zuytbrouck. His family was quite well-to-do; his father was a miller and his mother was a baker's daughter. Religion is a central theme in Rembrandt's paintings and the religiously fraught period in which he lived makes his faith a matter of interest. His mother was Roman Catholic, and his father belonged to the Dutch Reformed Church. 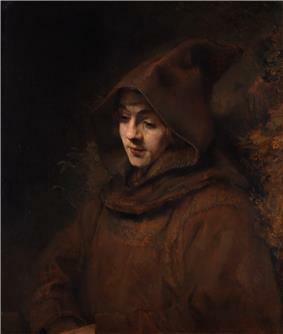 While his work reveals deep Christian faith, there is no evidence that Rembrandt formally belonged to any church, although he had five of his children christened in Dutch Reformed churches in Amsterdam: four in the Oude Kerk (Old Church) and one, Titus, in the Zuiderkerk (Southern Church). As a boy he attended Latin school and was enrolled at the University of Leiden, although according to a contemporary he had a greater inclination towards painting; he was soon apprenticed to a Leiden history painter, Jacob van Swanenburgh, with whom he spent three years. After a brief but important apprenticeship of six months with the painter Pieter Lastman in Amsterdam, Rembrandt stayed a few months with Jacob Pynas and then started his own workshop, though Simon van Leeuwen claimed that Joris van Schooten taught Rembrandt in Leiden. Rembrandt opened a studio in Leiden in 1624 or 1625, which he shared with friend and colleague Jan Lievens. 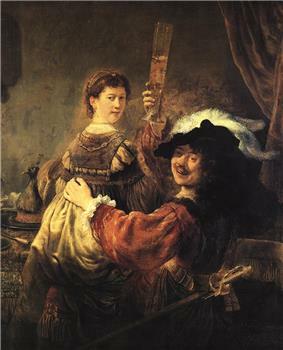 In 1627, Rembrandt began to accept students, among them Gerrit Dou. In 1629 Rembrandt was discovered by the statesman Constantijn Huygens, the father of Christiaan Huygens, (the Dutch mathematician and physicist), who procured for Rembrandt important commissions from the court of The Hague. 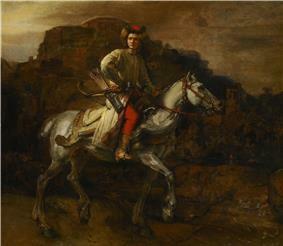 As a result of this connection, Prince Frederik Hendrik continued to purchase paintings from Rembrandt until 1646. 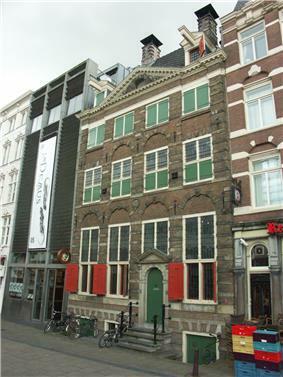 In 1635 Rembrandt and Saskia moved into their own house, renting in fashionable Nieuwe Doelenstraat. In 1639 they moved to a prominent newly built house (now the Rembrandt House Museum) in the upscale 'Breestraat' (eng. : 'Broadway'), today known as Jodenbreestraat (Jodenbreestraat 4,1011 NK Amsterdam-now) in what was becoming the Jewish quarter; then a young upcoming neighborhood. The mortgage to finance the 13,000 guilder purchase would be a primary cause for later financial difficulties. Rembrandt should easily have been able to pay the house off with his large income, but it appears his spending always kept pace with his income, and he may have made some unsuccessful investments. It was there that Rembrandt frequently sought his Jewish neighbors to model for his Old Testament scenes. Although they were by now affluent, the couple suffered several personal setbacks; their son Rumbartus died two months after his birth in 1635 and their daughter Cornelia died at just three weeks of age in 1638. In 1640, they had a second daughter, also named Cornelia, who died after living barely over a month. Only their fourth child, Titus, who was born in 1641, survived into adulthood. Saskia died in 1642 soon after Titus's birth, probably from tuberculosis. Rembrandt's drawings of her on her sick and death bed are among his most moving works. 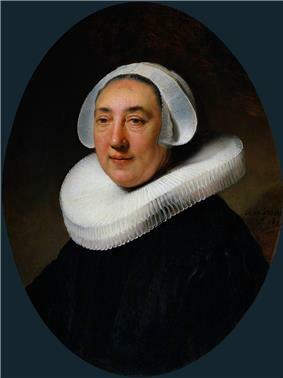 In the late 1640s Rembrandt began a relationship with the much younger Hendrickje Stoffels, who had initially been his maid. 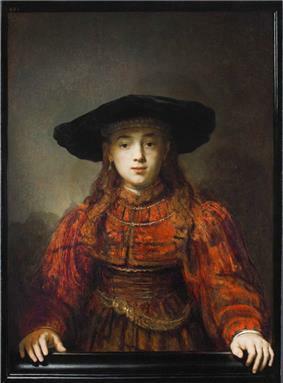 In 1654 they had a daughter, Cornelia, bringing Hendrickje a summons from the Reformed Church to answer the charge "that she had committed the acts of a whore with Rembrandt the painter". She admitted this and was banned from receiving communion. Rembrandt was not summoned to appear for the Church council because he was not a member of the Reformed Church. 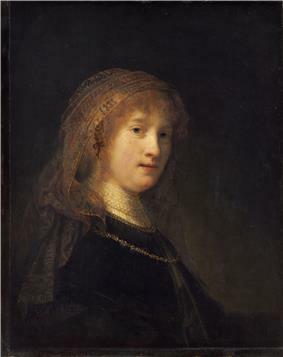 The two were considered legally wed under common law, but Rembrandt had not married Hendrickje; had he remarried he would have lost access to a trust set up for Titus in the son's mother's will. Rembrandt lived beyond his means, buying art (including bidding up his own work), prints (often used in his paintings), and rarities, which probably caused a court arrangement to avoid his bankruptcy in 1656, by selling most of his paintings and large collection of antiquities. The sale list survives and gives us a good insight into Rembrandt's collections, which apart from Old Master paintings and drawings included busts of the Roman Emperors, suits of Japanese armor among many objects from Asia, and collections of natural history and minerals; the prices realized in the sales in 1657 and 1658 were disappointing. Rembrandt was forced to sell his house and his printing-press and move to more modest accommodation on the Rozengracht in 1660. 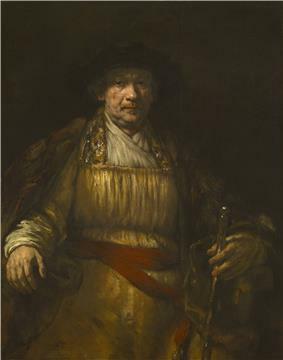 The authorities and his creditors were generally accommodating to him, except for the Amsterdam painters' guild, which introduced a new rule that no one in Rembrandt's circumstances could trade as a painter. 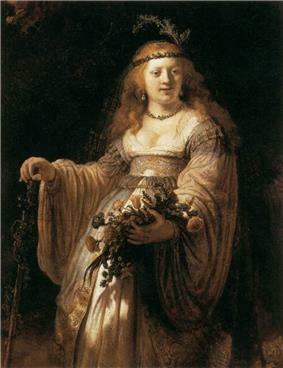 To get around this, Hendrickje and Titus set up a business as art dealers in 1660, with Rembrandt as an employee. Rembrandt outlived both Hendrickje, who died in 1663, and Titus, who died in 1668, leaving a baby daughter. He died within a year of his son, on 4 October 1669 in Amsterdam, and was buried in an unmarked grave in the Westerkerk. In a letter to Huygens, Rembrandt offered the only surviving explanation of what he sought to achieve through his art: the greatest and most natural movement, translated from de meeste en de natuurlijkste beweegelijkheid. The word "beweechgelickhijt" is also argued to mean "emotion" or "motive." Whether this refers to objectives, material or otherwise, is open to interpretation; either way, critics have drawn particular attention to the way Rembrandt seamlessly melded the earthly and spiritual. The Abduction of Europa, 1632. Oil on panel. The work has been described as "...a shining example of the 'golden age' of Baroque painting." It is known that Rembrandt ran a large workshop and had many pupils. His fame was such that important dignitaries visiting Amsterdam wished to buy pieces, and he was more than willing to comply if he could. 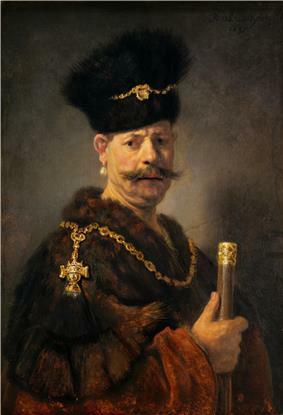 The list of Rembrandt pupils from his period in Leiden as well as his time in Amsterdam is quite long, mostly because his influence on painters around him was so great that it is difficult to tell whether someone worked for him in his studio or just copied his style for patrons eager to acquire a Rembrandt. A partial list should include Ferdinand Bol, Adriaen Brouwer, Gerrit Dou, Willem Drost, Heiman Dullaart, Gerbrand van den Eeckhout, Carel Fabritius, Govert Flinck, Hendrick Fromantiou, Aert de Gelder, Samuel Dirksz van Hoogstraten, Abraham Janssens, Godfrey Kneller, Philip de Koninck, Jacob Levecq, Nicolaes Maes, Jürgen Ovens, Christopher Paudiß, Willem de Poorter, Jan Victors, and Willem van der Vliet. 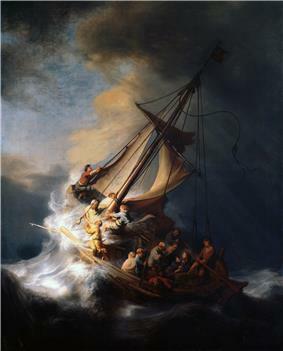 The most notable collections of Rembrandt's work are at Amsterdam's Rijksmuseum, including The Night Watch and The Jewish Bride. 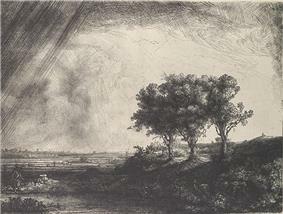 His home, preserved as the Rembrandt House Museum in Amsterdam, displays many examples of his etchings; all major print rooms have the majority of these, although a number exist in only a handful of impressions (copies). Other notable museums in Europe are The Hague's Mauritshuis, the Hermitage Museum in St. Petersburg, the National Gallery in London, Gemäldegalerie in Berlin, Gemäldegalerie Alte Meister in Dresden, The Louvre, Nationalmuseum, Stockholm, and Schloss Wilhelmshöhe in Kassel. The Royal Castle in Warsaw displays two paintings by Rembrandt from Lanckoroński collection in a separate, dedicated room of Renaissance Courtier Lodgings. The exposition of iconic Girl in a Picture Frame and its pendant Scholar at the Lectern was supplemented with X-ray examinations of the paintings and other works by contemporary Dutch artist's including Repentant St. Peter from Rembrant's workshop. Notable collections of Rembrandt's works in USA are the Metropolitan Museum of Art and Frick Collection in New York City, National Gallery of Art in Washington, D.C.
^ a b c Or possibly 1607 as on 10 June 1634 he himself claimed to be 26 years old. See Is the Rembrandt Year being celebrated one year too soon? One year too late? and (Dutch) J. de Jong, Rembrandts geboortejaar een jaar te vroeg gevierd for sources concerning Rembrandts birth year, especially supporting 1607. However most sources continue to use 1606. ^ "Doopregisters, Zoek" (in Nederlands). Stadsarchief.amsterdam.nl. 2014-04-03. Retrieved 2014-04-07. ^ Slive has a comprehensive biography, p.55 ff. ^ "Netherlands, Noord-Holland Province, Church Records, 1553-1909 Image Netherlands, Noord-Holland Province, Church Records, 1553-1909; pal:/MM9.3.1/TH-1971-31164-16374-68 —". Familysearch.org. Retrieved 2014-04-07. ^ Schwarz, p. 12. The sale was in 1658, but was agreed with two years for him to vacate. ^ Bull, et al., page 29. ^ Two hundred years ago Bartsch listed 375. More recent catalogues have added three (two in unique impressions) and excluded enough to reach totals as follows: Schwartz, pp. 6, 289; Münz 1952, p. 279, Boon 1963, pp. 287 Print Council of America – but Schwarz total quoted does not tally with the book. ^ It is not possible to give a total, as a new wave of scholarship on Rembrandt drawings is still in progress — analysis of the Berlin collection for an exhibition in 2006/7 has produced a probable drop from 130 sheets there to about 60. Codart.nl The British Museum is due to publish a new catalogue after a similar exercise. ^ "Schwarzlist 301 – Blog entry by the Rembrandt scholar Gary Schwarz". Garyschwartzarthistorian.nl. Retrieved 2012-02-17. ^ van de Wetering, page 285. ^ van de Wetering, pp. 163–5. ^ van de Wetering, pp. 155–165. ^ van de Wetering, pp. 157–8, 190. ^ See Strauss, where the works are divided by subject, following Bartsch. ^ From October 2007, the main galleries were closed for renovations, planned to be finished in 2010, but the Rembrandts are being shown in a nearby adjacent part of the building according to the Rijksmuseum website. 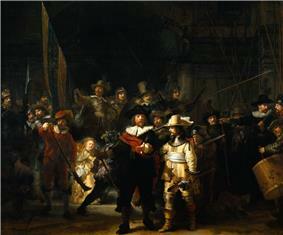 ^ "The Rembrandt Research Project: Past, Present, Future". Retrieved 11 August 2014. ^ "The Lanckoroński Collection - Rembrandt's Paintings". www.zamek-krolewski.pl. Retrieved 20 May 2014. The works of art which Karolina Lanckorońska gave to the Royal Castle in 1994 was one of the most invaluable gift’s made in the museum’s history. ^ Starcky, Emmanuel (1990). 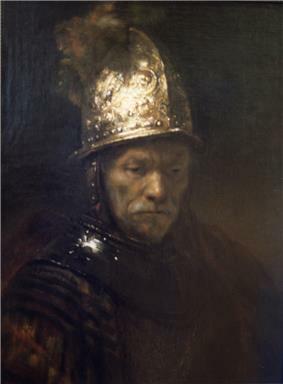 Rembrandt. Hazan. p. 45. Clark, Kenneth (1969). Civilisation: a personal view. New York: Harper & Row. Clough, Shepard B. (1975). European History in a World Perspective. D.C. Heath and Company, Los Lexington, MA. Durham, John I. (2004). 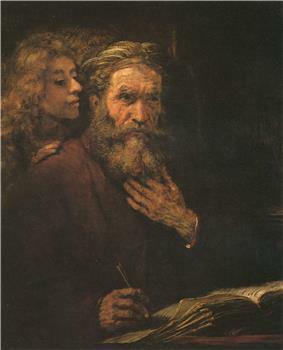 Biblical Rembrandt: Human Painter In A Landscape Of Faith. Mercer University Press. Van De Wetering, Ernst (2004) (2nd paperback printing). The Painter At Work. University of California Press, Berkeley and Los Angeles. University of California Press, London, England. By arrangement with Amsterdam University Press. ISBN O-520-22668-2.